This memorial website was created in memory of our loved one, Richard Hafer , 85, born on May 29, 1927 and passed away on December 15, 2012. Where Richard Hafer is buried? Locate the grave of Richard Hafer . How to find family and friends of Richard Hafer ? What can I do for Richard Hafer ? 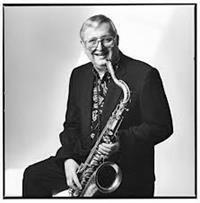 He was a famous American jazz tenor saxophonist who played for numerous of the big bands in jazz. Throughout his music career he worked with many famous people including Woody Herman, Lionel Hampton, Claude Thornhill, Benny Goodman, Ruby Braff, Herbie Mann, Bobby Hackett and many others. Hafer also released two albums Sentimental Mood and Prez Impressions. He died on December 15, 2012 in La Costa, California. Note: Do you have a family photo of Richard Hafer ? Consider uploading your photo of Richard Hafer so that your pictures are included in Richard Hafer 's genealogy, family trees & family history records. Sysoon enables anyone to create a free online tribute for a much loved relative or friend who has passed away. Address and location of Richard Hafer which have been published. Click on the address to view a map. Richard Hafer was born in Wyomissing, Pennsylvania, United States. 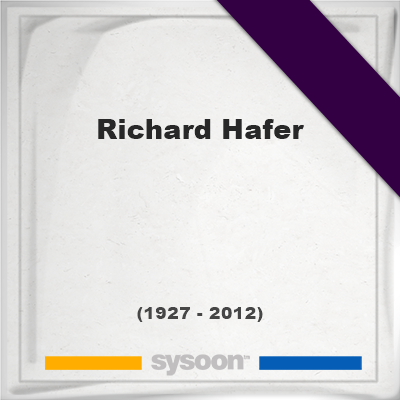 Richard Hafer died in La Costa, California, United States.